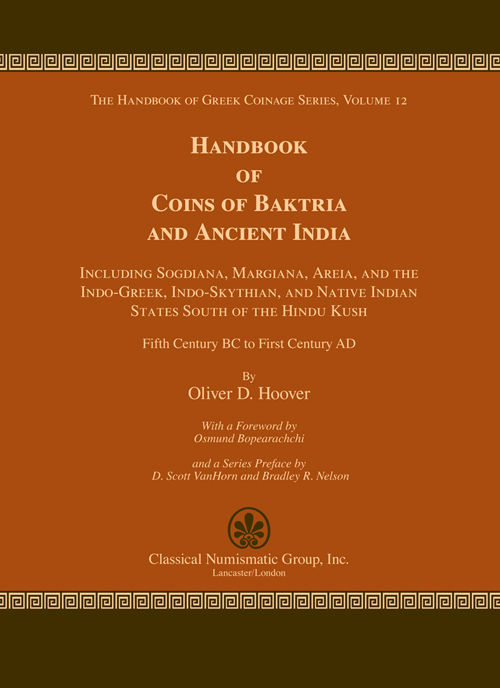 The latest published volume in the series is Handbook of Coins of Baktria and Ancient India, Including Sogdiana, Margiana, Areia, and the Indo-Greek, Indo-Skythian, and Native Indian States South of the Hindu Kush, Fifth Century Centuries BC to First Century AD (Volume 12 in the series). Beginning with the Kingdom of Baktria, the catalog covers all the Graeco-Bacrian and Indo-Greek kings. This volume includes the Indo-Skythian rulers and satraps, as well as the local coinages of the region. The Indian coinages south of the Hindu Kush are also included. While not obviously Greek coinage, these issues were struck in the context of their Greek neighbors and will add further evidence to the complex monetary systems of the region.